So I heard the other day that dystopia is the new vampire, at least in terms of what is coming down the pike in Hollywood movie releases. If the reaction to The Hunger Games is any indication, then I guess teens will be trading in their fangs and face powder for spears and arrows. I am not sure that's such a good thing. And where do they get off calling it The Hunger Games, anyway? I thought it was going to be about competitive eating or a battle of celebrity chefs; not a bunch of teenagers killing each other in gladiatorial contests. If that's the route they are going to go down, why not make it food critics battling it out to the death? Everyone wants to see that, don't they? 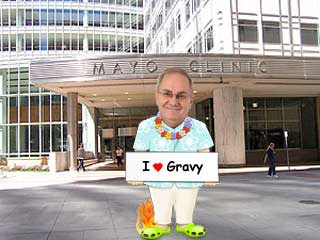 Speaking of food critics, did you see where former the New York Times restaurant columnist admitted to having gout last week? I guess that is an occupational hazard when you eat at fancy restaurants for a living. If you are not familiar with it, gout is a build up of uric acid crystals in your blood stream that settles in your joints, usually your big toe. It's really, really, painful, and has been described by the Mayo Clinic as feeling like your "toe is on fire". Clinical descriptions usually refrain from colloquialisms like "on fire," so you know it really hurts. Foods typically associated with causing gout are things like booze, anchovies, brains and other organ meat, broth and bouillon, goose, gravy, mincemeat, mussels, fish roe (caviar), scallops, sardines, sweetbreads and all types of yeasts. In other words, all the stuff you eat at fancy restaurants. Hmm, I might want to watch it myself, considering how much dining out I do. Of course that is another advantage to renting a timeshare: you almost always get a kitchen. Now I know you don't want to spend your whole vacation cooking and cleaning dishes, but preparing at least some of your meals can really save you some coin, and perhaps help you avoid a case of gout. Think about how much you spend on breakfast, lunch, and dinner during a typical seven night vacation stay. If you ate breakfast in your unit each morning, and packed a lunch each day, I bet you could save half of what you usually spend on meals, and still eat dinner out each night. Plus, you can take your doggie bag with you and stick it in your unit's refrigerator as a lunch or snack for the next day. Who knows, you might manage to return home the same weight as when you left, or less. All timeshare kitchens are not created equal, of course, so you are going to want to do some research. A large villa at Harborside Resort at Atlantis, for example, has a kitchen and dining area large enough to do Thanksgiving dinner. The Manhattan Club, on the other hand, has what is known as a kitchenette. So it is more than what you get with a typical hotel room, but it's not intended for any serious dining-in. In other words, it's like owning an apartment in New York City. Well, I am off to make my annual pilgrimage to Augusta, GA. There's nothing like the sights and smells of springtime in Georgia, as the world's best descend upon this corner of the Peach State. I am of course referring to the Hooters World Wing-Eating Championship Qualifier. Ten minutes and all the Hooters wings you can eat, with $500 and a trip to the championship round later in the year on the line. Now that's what I call a hunger game. I hear there is a golf tournament going on as well. I'll have to check it out.